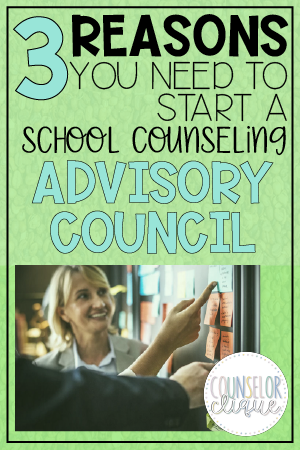 Each year, our 3 advisory councils prove to be one of my most favorite parts of our comprehensive school counseling program. It's definitely easier to make excuses than like "Doesn't my School Improvement Council or PTSA count as our advisory council, too?" NO! You want real input from real stakeholders who can help you actually make real improvements for your program. If I haven't convinced you yet, here are 3 reasons I think you should start a school counseling advisory council. 1- People want to be a part of something that inspires change for the better. I don't know how others do it, but, in my department, we are very strategic about who we invite to be a part of our advisory council. We try to double dip people's roles. For example: if there is a mom of a student, AND they work as a school counselor at our feeder middle school... BONUS POINTS! We want as many perspectives and voices in the room as possible while still keeping the crowd manageable. Some ideas for people you could probably think of off the top of your head-- someone who... you think already contributes to your program, you want more representation from in your program, does not understand the role of a school counselor, has great ideas worth sharing out... the list goes on. We believe all of these people have unique contributions because they view our program from different perspectives. It is worth being vulnerable and putting yourself and your program out there to hear feedback for better or for worse. I know they have felt their suggestions heard as we have directly implemented some of them. Every person we invited accepted our invitation. Before each meeting, we send an email invite. 2- Stakeholders' perspectives of your program will change. Do you feel like a lot of your job is information management? How do we make sure people are hearing the information we're putting out? If you have the right stakeholders around your table, they are going to take your mission and spread it farther than even you can. I love the idea that people walk away more informed about your program than when they started. If you have an administrator who barely knows what you do all day, INVITE THEM. If you have a parent who thinks you don't offer something unique that their child needs, INVITE THEM. At an Advisory Council Meeting, you get to share all of the innovative things you are doing in your school setting. Data can be extremely compelling among this crowd. This is your chance to summarize what you plan to do or what you've been doing... and then show it off! 3- Constructive criticism will challenge you to be empathetic. Feedback can be tough... but EMBRACE IT. Do the thing we're trying to teach our students- put yourself in someone else's shoes. Does the stakeholder not feel informed about what your program is doing? Well then... why is that? You will not improve without removing your blinders to see your own weak spots. Let others speak honestly without getting defensive for your actions. Be open to hear suggestions even if you've "always done it that way."